Ambergris Caye was probably named by the pirates who frequented the island in the early 17th century. On shores sheltered by the Belize barrier reef, the pirates discovered a convenient hiding place and due to the abundance of ambergris, an additional source of income. Ambergris, a form of whale excrement, was a critical ingredient for the manufacturing of perfume and fetched a good price in Europe. Although it is now considered an island, Ambergris Caye is actually the southernmost tip of the Yucatan Peninsula. The region was ruled by the Maya from approximately 900 AD – 1400 AD. The Maya conducted extensive trade in the region and probably dug the narrow channel that now separates Ambergris Caye from the peninsula to facilitate access by canoe. 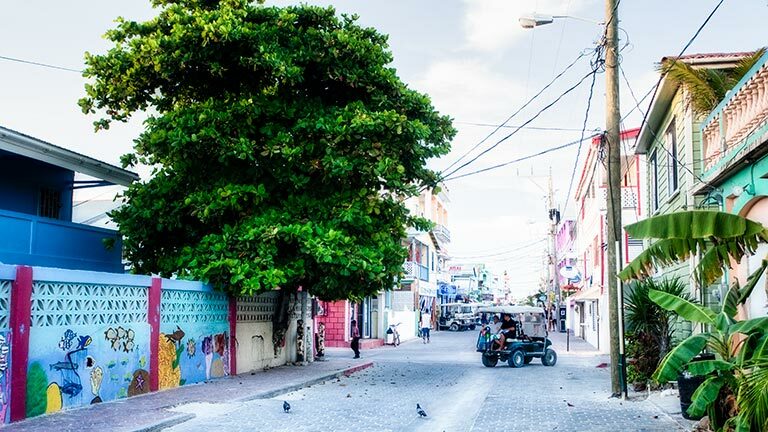 San Pedro, the main village on the island, was founded in 1848 by four families of Mestizo refugees who fled an insurgency in the Yucatan Peninsula. These settlers had been farmers and fisherman and provided food to the British landowners harvesting lumber in the area. Named for the patron saint of fisherman, Saint Peter, San Pedro began to grow and thrive. Coconuts were an important crop until the 1930’s, and at one time, there were a number of plantations on the island. The commercial harvest and export of lobster began in the 1920’s, and eventually led to the formation of fishing cooperatives in 1960. The first tourists arrived in Ambergris Caye in the late 1950’s and the first hotel was built on the island in 1965. Commercial air travel began a few years later and the tourist industry grew from there. The first dive shop opened in 1970 and today travelers can explore the Hol Chan Marine Reserve off the southern tip of Ambergris Caye with a certified dive master and guide. San Pedro Town has a variety of fine restaurants and is host to visitors from all over the world. The fishing around Ambergris Caye is also a big draw. Some of the finest flats fishing in the world is minutes from the island. Tourism is now the foundation of the local economy and islanders are proud to share the beauty and hospitality of their home.